Board Size:10' x 35" x 6"
The whopper was one of the first Starboard SUP models we brought in back in 2009. Since then it’s proven to be one of the most versatile shapes in their line. When they began to offer it in an inflatable option it made the versatility even more convenient! Not only is the shape good for just about any situation, now you can roll it up and carry it in a backpack. We’ve surfed it, leisure paddled it, done yoga, and ran rivers on the whopper, it’s a stable platform that will make you happy wherever you are. This is one of the areas that Starboard really set themselves apart from most of their competition this year. The Astro Deluxe models now feature removable FCS compatible Side fin boxes and a regular Longboard center fin box. This means your fin configuration options are endless. That’s a really nice feature to have, especially for the Whopper. The Whoppers shape naturally excels in many types of situations. Now you have the option to fine tune the fin configuration for your intended use! It also nice to be able to remove and replace damaged fins easily. We all know that things happen and it’s a lot easier to replace or repair a removable fin than it is one that’s glued on. We all want our board to last forever, why subject yourself to a chewed up fin! The ability to remove all the fins also makes it roll up better and fit in its storage backpack too. Starboard definitely didn’t spare any expense when designing the new Magic Bag. It’s probably the most convenient, feature full bags of all the inflatable brands we work with. 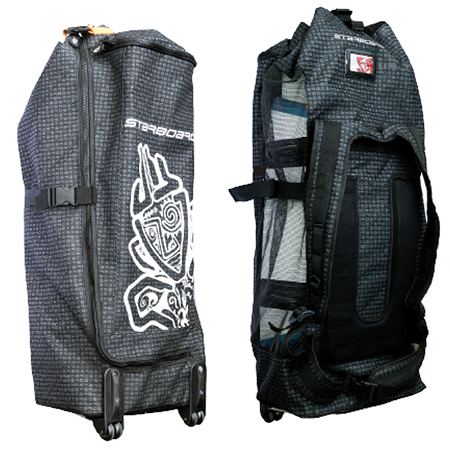 You have backpack straps in order to carry the bag on your back as well as wheels that allow you to easily roll wherever you want to go. While your rolling you don’t even have to worry about wearing out the bottom, thanks to the plastic reinforced tray that’s built in! Pumping up your inflatable is one of the biggest objections we come across when we talk with people about inflatables in general. This year Starboard has tried to make that task a little easier by offering a double action pump with a switch. The pump injects air on the upstroke and the down stroke when in double action mode. You use this until the pressure gets hard enough to make pulling the handle back up difficult. Then it’s time to flip the switch and put the pump in single action mode, filling the board only on the down stroke where you can use you bodyweight more effectively. Pretty genius system, we think you will like it for sure. If you still don’t feel like pumping, we have several really good electric pump options to make inflation a non-issue! 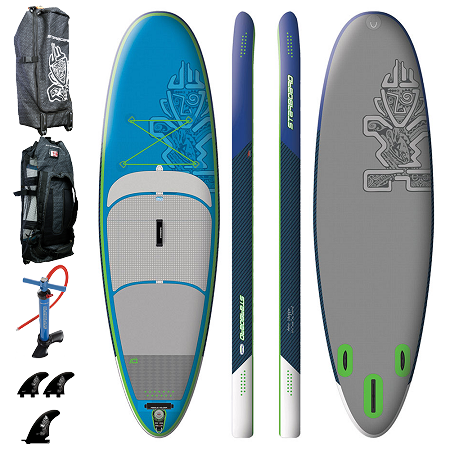 Shorter length increases the maneuverability, making it an easy board to turn, whilst maintaining good glide for flat-water paddling. 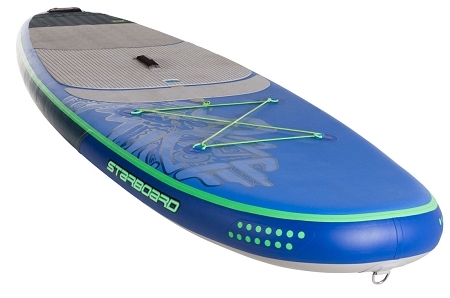 The 35” width means it is an incredibly stable board that is great for surfing, stretching, fitness, yoga and on the river. Available in Deluxe, Zen and now in new Club Technology for extra strength and durability for schools and clubs. Equipped with bungee tie-downs and paddle holder..